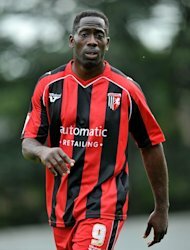 A black footballer was unfairly sacked by Gillingham FC after being racially victimised, an employment tribunal has ruled. Former Barbados international player Mark McCammon, 33, took legal action against the League Two side after being dismissed for alleged misconduct last year. The 6ft 2in striker told a hearing in Ashford, Kent, that he and other black players at the club were treated differently from white players. McCammon said he was ordered to come into the ground amid "treacherous", snowy driving conditions while some white players were told they were not required. He also said the club tried to "frustrate him out" by refusing to pay private medical bills to help him regain his fitness following injury. Instead, he claims he was offered the same operation on the NHS rather than privately, a move he described as "completely out of character" for a Football League club, and that he was fined two weeks' wages when he paid a visit to a private consultant. In contrast, the former Charlton, Swindon, Millwall and Brighton player said, a white team-mate was flown to Dubai for treatment by an eminent physiotherapist at the club's expense. In a letter sent to the Professional Footballers' Association (PFA) outlining his grievances, McCammon also claimed he was told not to blog while others were permitted to. Officials at Gillingham said they were "staggered" by the ruling, saying the club had employed thousands of staff of different races and religions. The club said in a statement: "Today we have received the decision of the Ashford Employment Tribunal which sets out their findings that Mark McCammon was unfairly dismissed and that his dismissal was an act of racial victimisation. We are hugely disappointed, in fact staggered, by this decision. As an organisation we are an equal opportunity employer and do not discriminate against, nor victimise our staff. "This case is the first of its kind to be brought against the club in its entire history, a history that has seen the club employ many thousands of staff of various race, religion and creed, none of whom have ever felt the need to bring such a claim. "Given the nature of the case, and the findings, we will discuss the judgment with our lawyers and decide upon the next course of action, whether that be an appeal against the findings, or another form of action, as deemed appropriate. There will be no further comment on the case by the club until the matter has run its full course."